Sorry there's no post about food today. But I think you'll like this. Here's a sneak peek of our invitations for our small wedding. Designed by Josh and I, and letterpressed by a good friend. We're checking things off the list as October quickly approaches (hello, flowers and cupcakes!). I'd have to say, the flexibility of freelancing has helped us plan this thing over the past six months. Are any of you planning a wedding? Also I have a question for you. What do you enjoy reading on this blog and/or what would you like to see more of? 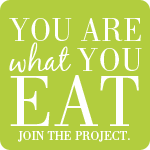 I appreciate all of you following along with me the past few years as I share my passion for healthy eating here. Would love to hear from you now! Hey Adrienne-- I love reading your healthy recipes -- in particular ones that follow a day of shopping at the farmers market, and healthy/fast lunch ideas. I get in turkey or hummus sandwich ruts too easily! hey adrienne~ i love your blog and all your links. i wanted to submit a recipe my boyfriend and i came up with while we were hiking, and i wasn't sure how to do it (so sorry it's a comment). it's an asian deviled egg recipe. it's the first post on my blog. love all your vegetarian recipes! I'm new to your site. HI! New to eating healthier so we're testing and transitioning as a family, which can be challenging. So far I've loved what I've read so keep doing what you're doing. tell us what you love learning in school! I get to peruse the library @ The Natural Gourmet (Annemarie Colbin) sometimes - endlessly fascinating! I learn a lot and buy some books.... also love your sense of what goes together and your ability to make the breakfast you want! I always love your recipes!! I'm all about eating healthy-- with some good treats everyone once in a while. maybe, a little too often :) And I also love graphic design, so posts such as this one are wonderful as well! I love letterpress and these are gorgeous! 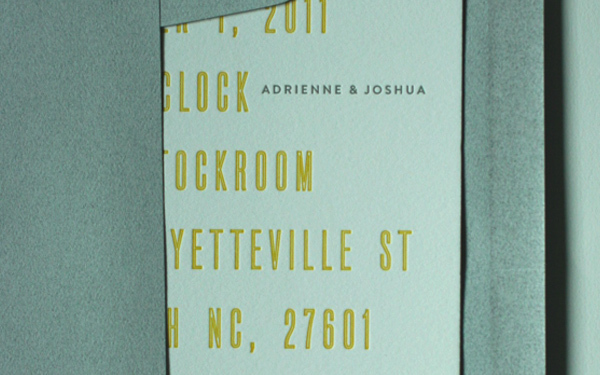 Love the letterpress invitations you both created...especially the yellow+gray combination! Congratulations on the upcoming wedding!